Details relating to the Slovakian Commemorative of 2011. 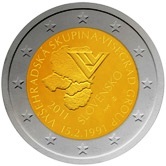 The coin commemorates the 20th anniversary of the forming of the Visegrád Group i.e. Slovakia, The Czech Republic, Hungary, Poland. The Visegrád Group is a loose co-operation between the four states in economic affairs and in attracting foreign investment. The agreement was signed in the Hungarian city of Visegrád. In the inner circled an outline of the four countries is shown as well as a stylized V IV. The group is also known as the V four group. Around the edge of the inner circle the legend “ VYSEHRADSKÁ SKUPINA * VISEGRAD GROUP” appears. The first part being the name in Slovakian. Underneath the map the name of the issuing country ”SLOVENSKO” is shown and under the country name the initials of the designer ”MR” and the mint mark – MK within a small circle. From Slovakian Commemorative 2011 to euro coin collector.